An extraordinary leader, freedom fighter and architect of the integration of India, Sardar Vallabhbhai Patel, better known as “Iron Man of India,” remains an enduring icon of patriotism, nationalism and the spirit of public service. 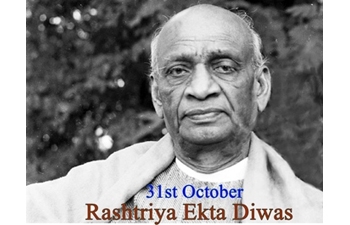 In a fitting tribute to this giant, India will be launching week-long celebrations on Sardar Patel’s birth anniversary on October 31, which has been aptly designated as Rashtriya Ekta Divas or National Unity Day. A quintessential self-made man, Patel’s life story exemplifies the sheer power of will, hard work and sincerity as he scripted a new life for himself first as a lawyer, and then as a freedom fighter and nation-builder amid trying circumstances. Born on October 31, 1875 in the influential Patidar community, he did his early schooling in Gujarat and decided to study law in London. But the untimely death of his father plunged the family into a financial crisis. Fired by his steely determination, which was to remain his defining trait till the end, the young Patel “studied very earnestly for the law examination and resolved firmly to save sufficient money for a visit to England.” He finished his LL.B from the Middle Temple, England in June 1912 in a record two-and-a-half years and returned to India. His formidable legal acumen earned him a dedicated clientele, and he became a much sought-after lawyer earning thousands of rupees every month. All this success and money, however, did not go to his head; on the contrary, it only kindled his thirst to do something for society and leave a lasting legacy. “No doubt, my practice is flourishing today. I am also doing something big in the Municipality. But, my practice may or may not be there tomorrow. My money will be blown tomorrow, those who inherit my money will blow it. Let me leave them a better legacy than money,” Patel wrote later about this key moment which was to drive him to dedicate his life to the nation. A chance meeting with Mahatma Gandhi at the Gujarat Club in Ahmedabad in 1915 strengthened his resolve. Inspired by the life and philosophy of Mahatma Gandhi, Patel became Gandhi’s ardent follower, and a fellow traveler in India’s freedom journey. In 1918, Vallabhbhai Patel transformed into Sardar Patel when he led the farmers’ agitation against the British who insisted on collecting tax despite a raging flood in Khaira, Gujarat. He led a successful and peaceful “No Tax campaign” which forced the British authorities to return then land taken away from the farmers. Patel’s heroic efforts to mobolise farmers earned him the title of Sardar, which means ‘chief’ in Hindi and Urdu. Sardar Patel later on deftly deployed the Gandhian methods of peaceful resistance many times in defending the rights of farmers, the subjugated and the exploited. In 1930, Sardar Patel was imprisoned for participating in the Salt Satyagraha launched by Mahatma Gandhi. His eloquent speeches during the salt movement inspired thousands to join Gandhi’s mission of emancipating India from the clutches of foreign rule. Despite internal wrangling in the Indian National Congress, Patel remained a staunch supporter and ally of Mahatma Gandhi. The differences over the course of the freedom movement came out in the open when veteran leaders questioned the logic and efficacy of civil disobedience movement linked to Gandhi's Quit India Movement in 1942. Sardar Patel robustly rallied to Gandhi’s defence, and eventually the All India Congress Committee was compelled to ratify and sanction the Quit India Movement. Given his formidable organizational abilities and unflinching commitment to nation-building, Sardar Patel was appointed as the first deputy prime minister and home minister of independent India, the crucial posts which brought out the best in him and help create an integrated and unified India as we know it now. Patel the Unifier is justly remembered for his iron will and firmness with which he facilitated the integration of over 500 princely states into the framework of federal India. Patel used his fabled powers of persuasion and diplomacy, and combined it with a judicious use of the threat of force to get 565 princely states to accede to India. This was a monumental feat which earned him mass adoration and gratitude, cementing his reputation as the Iron Man of India. In the aftermath of Partition, Patel was to show his extraordinary concern for refugees, regardless of their religion. Moved by their plight, Patel organized relief for refugees fleeing from Punjab and Delhi and spearheaded efforts to restore peace across the nation. An appraisal of Patel’s legacy would be incomplete without his role as a social reformer and thinker. His efforts to reform the Hindu religion went side by side with his unstinting commitment to religious freedom. In the economic realm, Sardar Patel tirelessly championed self-sufficiency and promoting the growth of domestic industries by harnessing indigenous resources, talent and expertise. The idea of the state as an enabler of national development and resurgence animated Patel’s thinking. His vision of the State was in tune with the political values he propagated. Nationalism and patriotism were not only the foundation stones of a state, but were the core elements holding it together. In Patel’s thinking, individual liberty had to be in consonance with the provisions of the Constitution. To create a modern nation, he promoted the emancipation of backward communities and women through the Gandhian programmes and expertly utilized the higher castes for social integration and political mobilisation. A pragmatist and realist to the core, Patel was a sharp observer of the international scene and advocated a realistic foreign policy in place of a symbolic idealism. He consistently advocated that no move must be adopted that would compromise the territorial integrity of India, and in particular, cautioned against internationalizing the Kashmir dispute. “I should like to make one thing clear, that we shall not surrender an inch of Kashmir territory to anybody,” Patel famously said. While espousing friendly relations with India’s neighbours, Patel was quick to recognize that warmth should not be interpreted as weakness. In November of 1950, Patel wrote a letter to PM Nehru outlining how the Chinese troops’ entry into Tibet earlier that year resulted in a situation that “for the first time, after centuries, India’s defence has to concentrate itself on two fronts simultaneously.” Patel had suggested that “we have to consider what new situation now faces us as a result of the disappearance of Tibet as we know it, and the expansion of China up to our gates”. Patel’s cautionary note was to prove prophetic when China invaded India in 1962. Sardar Patel may have lived only two and a half years after India’s independence, but in those few months, he shaped the narrative of a modern, strong and self-reliant India. Often compared to Germany’s legendary leader Otto van Bismarck for his key role in the integration of princely states into India, Patel contributed to nation-building in myriad ways. He was a leading light in the Constituent Assembly of India and played a pivotal role in the appointment of Dr. Bhimrao Ramji Ambedkar as the chairman of the drafting committee, and the inclusion of leaders from across the political spectrum in the process of scripting the constitution. Not many know it, but Sardar Patel was the founding father of the Indian Administrative Service and the Indian Police Service, and introduced articles to protect the independence and impartiality of the civil services. Besides his colossal achievements, Sardar Patel exemplified humility and Gandhian ideals of simple living and high thinking. His personality was such that he inspired instant respect and affection, even amongst those who differed with him. He remained hugely popular till his dying day. More than a million people attended his cremation in Sonapur in Bombay, which included Prime Minister Nehru, C. Rajagopalachari, and President Rajendra Prasad. In a tribute to his role in creating civil services, more than 1,500 officers of India's civil and police services gathered to mourn at Patel's residence in Delhi a day after his death and pledged “complete loyalty and unremitting zeal” in India's service. Decades after his death, Sardar Patel’s absolute love and devotion for India continues to inspire all those who are engaged in the resurgence of India. Tributes and honours continue to pour in for this legendary figure to this day. Time magazine put Sardar Patel on the cover in its January 27, 1947 issue, and called him “The Boss.” Sardar Patel was finally conferred India’s highest civilian honour, the Bharat Ratna, in 1991.